For those unfamiliar with Contagious Magazine, it's just about one of the best publications (online and offline) that you can lay your hands on. Contagious describes its purpose as being "to explore the shifting relationship between brands and consumers, to predict the impact of new technologies and to make sense of the fragmenting media landscape". Contagious says it "exists to simplify and to advise. It is the global marketing industry’s early warning system; an intelligence resource for those attempting to stay ahead of all this change". 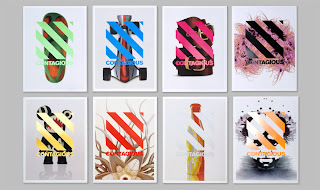 Contagious comes out quarterly with a free DVD showcasing over 100 pieces of creative work per issue. The DVD highlights each of these campaigns in a ‘challenge/solution/results’ format. The following video is the Q3 promo featured on the most recent issue's DVD. Shown are Ken Block's DC csampaign, Evian's Skating Babies and the Nike Paul Rodriguez 'Today Was a Good Day' ad. Also shown are previews of some augmented reality features and a Technophilia showcase. If you enjoyed this, check out Contagious's YouTube channel.